Give A Basket Full Of Love- WANI 1st Annual Easter Drive! Help bring a basket full of love to homeless children on Motel Drive. 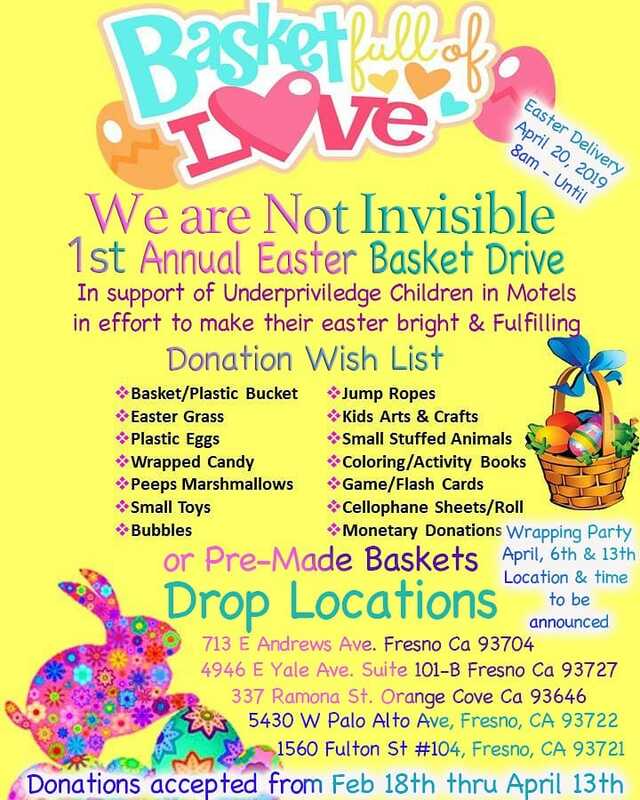 We Are Not Invisible is launching our first annual Easter Basket Drive for underprivileged children in an effort to make their Easter bright and fulfiling. Help us by donating pre-made baskets or items to add to baskets. Easter Basket Outreach- Saturday, April 20, 8:00am. Sign up to get meet up information. Sign up to volunteer at Good For All here!! And it’s a huge need for our street family. Without adequate, regular access to water, our street family deal with lack of proper hydration. Summer can be an especially dangerous time, with increase risks of heat stroke, heat exhaustion, and other dehydration related health problems. We need partnerships, starting this spring time, with community members to provide water to our street family. Plan with your church, group, or family and friends to raise donations of water or donate financially directly to We Are Not Invisible. Sock Drive: A thousand pairs of socks in a week? We can do it, Fresno!